An emotional Jim Furyk tips his hat to fans as he closes out his final round at THE PLAYERS on Sunday. He finished runner-up to Rory McIlroy. An emotional Jim Furyk waves to fans as he closes out his final round at THE PLAYERS on Sunday. He finished runner-up to Rory McIlroy. Jim Furyk embraces his caddie, Mike “Fluff” Cowan, after his final round of THE PLAYERS on Sunday. Furyk finished runner-up to Rory McIlroy. Jim Furyk attempts a shot Sunday at THE PLAYERS. He finished the tournament 15-under 273 and runner-up to Rory McIlroy. After Jim Furyk birdied on 18 late Sunday at THE PLAYERS, a few tears crept down his face as he tipped his hat to the crowd and walked toward the TPC Sawgrass Clubhouse. At that moment, Furyk was the leader of the tournament at 15-under, but perhaps more significant, the longtime area resident was home, with friends and family in the crowd, and he had returned to a state of his game not seen in years. Furyk qualified for THE PLAYERS as one of the last six golfers in the field, according to the PGA TOUR. Planning to have an off week, he learned of his fate the Sunday before the tournament, sometime between hosting a baby shower for military moms-to-be, and a charity concert for his foundation. He took advantage of the last-minute opportunity. After shooting a 1-under 71 on a blustery Thursday afternoon, Furyk played in calmer conditions on Friday morning and shot a course-best 8-under 64, making eight birdies and 10 pars. It was his lowest score in 80 rounds at THE PLAYERS, and he was tied for third at 9-under. On Saturday, Furyk didn’t have as much success, shooting another 71, but he played well enough to stay within striking distance for Sunday. He finished at 10-under, tied for sixth and five shots behind third-round leader Jon Rahm. Paired with Joel Dahmen, Furyk started Sunday’s round with a bogey at 1, but recovered with an eagle at 2 and made par on 3 and 4. The sequence of events at holes 5 though 8, where Furyk went birdie, par, par, par, proved to be crucial. After a par on 9, Furyk said he told his caddie, Mike “Fluff” Cowan, he had to make an adjustment heading into the back nine, because something just wasn’t right. The halftime adjustment was perfectly planned. Furyk birdied on 10 and 11 and jumped to the top of the leaderboard. Then tied with Rahm for the lead at 14-under, the crowds surrounding Furyk began to quickly multiply. After nearly draining a 14-foot putt on 12 for birdie, Furyk settled for par. On the walk from 12 to 13, he pounded the waiting fists of a few kids standing behind the ropes. “What’s up, guys?” Furyk calmly asked, as a few other kids started screaming Fluff’s name. Furyk made par on the par-3 13th, and then drained a 6-foot putt for par at 14. Jacksonville resident Bill Koch was excited to see Furyk’s run unfold before his eyes. A missed putt for par at 15 resulted in a costly bogey for Furyk, which dropped him to 13-under and tied for third. Nevertheless, Ponte Vedra High School senior Matt Howard was impressed on the way to 16. After a birdie at 16, Furyk was back at 14-under. On the way to 17, it seemed as if every fan in the stands was a direct member of the Furyk family, with cheers, whistles and applause resonating throughout the iconic golf arena. Once on the Island Green, he nearly birdied but missed just right, finishing the hole with a par. At the par-4 18th, Furyk hit a round-defining 7-iron to within 3 feet of the hole and ultimately birdied to finish the day 5-under 67 as the clubhouse leader. Furyk’s dramatic finish did not ward off the roar of Rory, who was a few holes behind. Furyk said that end result, though, doesn’t take away from his feelings about his performance. 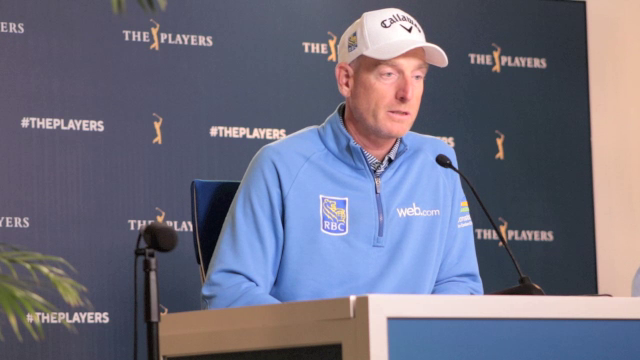 As for the future, Furyk said he still plans to play 18 to 20 events in total this year, but his performance at THE PLAYERS may result in him changing his schedule, as he will qualify for additional tournaments.